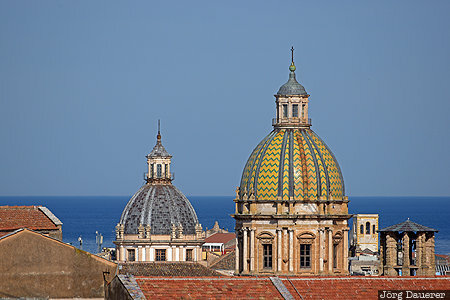 Cupolas and roofs of Palermo and the Mediterranean Sea in the background seen from the roof of the Cathedral of Palermo. Palermo is the capital of the Mediterranean island of Sicily, Italy. This photo was taken in the afternoon of a sunny day in April of 2017. This photo was taken with a digital camera.